Social media was buzzing a couple weeks ago with rumors that Crystal Pepsi was making a comeback. Sadly for those looking forward to a moment of junk food nostalgia, it appears that the rumors were falsely started on a satirical news site. Though, if anybody at Pepsi has any sense, they should be taking advantage of the buzz and bring Crystal Pepsi back for real. 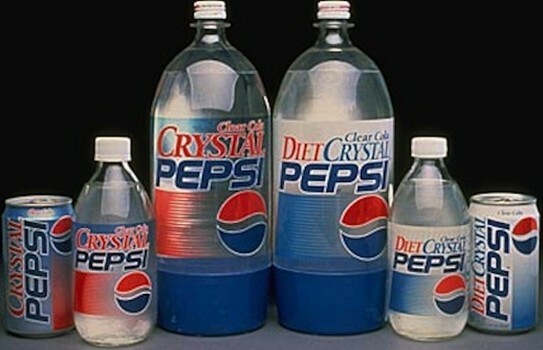 The product may have be considered a flop but whoever created the Crystal Pepsi commercials knew what they were doing. They were so epic that, even 20 years later, most folks of a certain age can’t help but hear Sammy Hagar in their heads at the mere mention of Crystal Pepsi. Crystal Pepsi might not becoming back anytime soon but it did get me thinking about other lost Generation X food products that I would like to see return. First choice has to go to Apple Slice soda. Also from Pepsi Co, Apple Slice was part of a range of fruit flavored Slice branded sodas that were out in the mid 1980s. Grape, pineapple, peach, strawberry and, the fairly progressive for the time, passion fruit were just some of the other varieties of slice soda. I can’t say that I remember the taste of any of them other than Apple Slice soda. My mother was pretty into it at the time, especially the Diet Apple Slice. I can’t blame her because it was a flavor unlike any other soda of the time. Tart and crisp a bit like a sharp cider taste. The nearest I have gotten to it since was in the UK with Apple Tango soda but it wasn’t as full bodied as I remember Apple Slice tasting. Around about the same time period as Slice, there was a potato chip offering from Keebler called Tato Skins. There was a bunch of Tato Skins flavors such as cheddar and bacon, sour cream and onion, and steak and potato but my favorite was the basic baked potato flavor. I’ve heard from several people that T.G.I. Friday’s Potato Skins is the same product as Keebler’s Tato Skins just under a different name. Has anybody that remembers Tato Skins tried them? What is the verdict? Why did Jello-O Pudding Pops get taken off the market in the first place? Perhaps my home wasn’t representative of the nation at large (in OH so many ways) but we almost always had them in the freezer. Jell-O put out both gelatine and pudding pops. I would eat the gelatine ones if they were around but they have a slightly odd texture. The pudding pops, on the other hand, were great. Especially the chocolate and vanilla swirl pudding pop variety. I was the fat kid that was always on one diet or another. In addition to the the taste, the pops were on the lower end of the calorie spectrum from most of the snacks I enjoyed. The Jell-O Gelatine pops were a mere 35 calories each and the Jell-O Pudding Pops came in at 90 calories each. Plus, Bill ‘The Cos’ Cosby was on TV every day pushing them too us. Any friend of Mortimer Ichabod Marker had to be taken seriously. P.S. Was there a butterscotch flavor of Jell-O Pudding Pops or am I just dreaming it into existence? This entry was posted in Foodie and tagged Junk Food, snacks. Bookmark the permalink.